7. What Happens When a Troll Dies? This guide is intended to provide a comprehensive description of the encounter with Council of Elders in Throne of Thunder. It is targeted at anyone who desires to understand the fight mechanics. The Council of Elders makes up the third boss encounter of the Throne of Thunder. During the fight, you will face four Troll bosses at the same time, and the complexity of the fight stems from dealing simultaneously with the abilities that these four bosses use. The fight adds a number of positioning constraints on the raid and will require a great deal of control on the DPS you do on each target. We do not know what the hard enrage timer of this fight is, currently. There does not appear to be a soft enrage timer of any sort. In addition to the items listed below, the Council of Elders drops the tokens that you will need for buying your Tier 15 Hands parts. We currently have no information about the enrage timer. We will update this section when we know more. The fight against the Council of Elders is a single-phase encounter during which you must defeat four Trolls: Frost King Malakk, Kazra'jin, Sul the Sandcrawler, and High Priestess Mar'li. Your raid will have to face all four Trolls until they die. They do not share health and they all have their own abilities, which will present your raid with many challenges. To make things harder, the spirit of Gara'jal the Spiritbinder will provide assistance to the Trolls. As a result, one of the Trolls is always empowered. While empowered, a Troll becomes more dangerous and eventually starts channeling an ability that deals heavy raid-wide damage. A Troll is broken out of his empowerment after receiving 25% health in damage. When this happens, a new Troll gets empowered. This empowerment cycle continues until all the Trolls are dead. We have released a video guide for the fight against the Council of Elders. We strongly recommend watching the video in order to get a better visual idea of the fight. On our forums, we are maintaining threads with class-specific advice for each of the fights of Throne of Thunder. So, make sure to check them out, and if you have things to share, do not hesitate to contribute! after reaching 100 Dark Energy, the Troll stop using their abilities and keeps casting Dark Power, which deals increasing damage every second. To break a Troll out of the empowerment, you need to damage that Troll for 25% health. For example, if a Troll gets empowered at 90%, then the empowerment will stop when that Troll's health reaches 65%. a new Troll is empowered by the Spirit of Gara'jal. Frost King Malakk always seems to be empowered first. We are unsure if subsequent empowerments are random or if they target the non-empowered Troll with the highest health. Let us know if you have an opinion on this issue. When a Troll dies, the remaining Trolls are not healed, unlike what usually happens in council fights. When a Troll dies while empowered, nothing out of the ordinary happens, the empowerment will jump to another Troll, and the empowerment cycle will continue with the remaining Trolls. When a Troll dies while not empowered, there is one thing to watch out for. Namely, if there are only 2 Trolls left and you kill the Troll that is not empowered, then the empowered Troll will remain empowered until you kill it. This can be problematic if the empowered Troll still has a lot of health and is already at 100 Dark Energy. Each of the Trolls uses a specific set of abilities. When a Troll is empowered, they use a slightly different set of abilities. In addition his melee attack, Frost King Malakk has two abilities: Frigid Assault and Biting Cold. Frigid Assault deals Frost damage to the tank and also applies a stacking debuff on them. The debuff does nothing before it reaches 15 stacks. When this happens, the tank becomes stunned for 15 seconds. Dealing with this debuff requires a tank switch. Biting Cold is cast at a random player, which deals Frost damage to the targeted player and causes them to deal Frost damage every 2 seconds to all allies within 4 yards. This effect lasts 30 seconds. in LFR difficulty, each player within 4 yards of the afflicted player will cause the afflicted player to lose 4 stacks of the debuff. Note that stacks of Frostbite cannot be reduced below 1. Kazra'jin keeps using Reckless Charge, which causes him to rush towards the location of a random raid member, damaging everyone in his path and knocking back players who are still at the targeted location when he arrives. When Kazra'jin is empowered, he will cast Overload after each Reckless Charge. This causes him to become stunned for 20 seconds, during which he will reflect 50% of the damage he takes as Nature damage. In addition to his melee attack, Sul the Sandcrawler has two abilities: Sand Bolt and Quicksand. Sand Bolt targets a random player and deals Nature damage to them as well as to all players within 5 yards of them. This ability can and should be interrupted. Quicksand creates a pool of sand at a random's player location. Every second, it deals Nature damage to anyone standing in it. Each time a player takes damage from Quicksand, they receive a stack of Ensnared, which reduces their movement speed. If they reach 5 stacks of that debuff, they become Entrapped for 30 seconds. When Sul is empowered, he will cast Sandstorm every 40 seconds (so twice per empowerment, maximum). This ability transforms every Quicksand pool into a Living Sand. These adds keep attacking their target with a melee attack. When a Living Sand dies, it leaves behind a Quicksand pool. While the Living Sands do not deal much damage, it is not a good idea to keep them alive (the only reason for doing so being that it reduces the number of Quicksand pools on the ground) because they receive a stack of Fortified every time Sandstorm is cast. This buff increases their damage done by 100% and heal them to full health. In addition to her melee attack, High Priestess Mar'li has two abilities: Wrath of the Loa and Blessed Loa Spirit. Wrath of the Loa targets a random raid member and deals Holy damage to them. This ability can and should be interrupted. Blessed Loa Spirit summons a Blessed Loa Spirit at Mar'li's location. This spirit does nothing but run towards Mar'li's ally with the lowest remaining health. If it reaches them, it will heal them for 10% of their maximum health. If the spirit is still alive after 20 seconds, it will instantly jump to its target and heal them for 10%. The spirit can be slowed and rooted. When Mar'li is empowered, she casts slightly different abilities: Wrath of the Loa and Shadowed Loa Spirit. Wrath of the Loa does the same thing as her other ability of the same name, but it deals Shadow damage instead of Holy damage. Shadowed Loa Spirit summons a Shadowed Loa Spirit at Mar'li's location. This spirit does nothing but fixate on a random raid member. If the spirit comes within 6 yards of that player, they will die. If the spirit is still alive after 20 seconds, it will instantly jump to the targeted player and kill them. The spirit can be slowed and rooted. Having to deal with the abilities of all the Trolls at the same time makes up for a complex encounter. To explain what the raid has to do more clearly, we will break down our instructions by role (tank, healer, DPS). That said, there are concerns that everyone shares and we will start with them. when Frost King Malakk is empowered, make sure that 2 players in 10-man, 4 players in 25-man, and 1 player in LFR stand within 4 yards of the afflicted player. This will make Frostbite easier to deal with. For melee players, it will be harder to spread properly, so they will simply have to contend with more damage taken. Also, they will often need to all move to avoid the charges from Kazra'jin or the Quicksand pools. Note that in 25-man, having 0 or 4 players standing within 4 yards of the player afflicted by Frostbite does not change the overall damage that this ability does (1 hit with 5 stacks is the same as 5 hits with 1 stack). The only difference is that, with 4 players within 4 yards, the damage will be spread between these players and the afflicted player, making it easier to heal. Because of Blessed Loa Spirit and Shadowed Loa Spirit, you will generally want to stay away from High Priestess Mar'li, unless you need to be in her melee range to attack her. For Blessed Loa Spirit, the idea is that if the lowest health Troll is Kazra'jin, then you want to avoid him charging a player close to Mar'li just as she summons a Blessed Loa Spirit. For Shadowed Loa Spirit, the spirit targets a random raid member, so if everyone is far away from Mar'li (except for her tank, whom the spirit never seems to target), then it will be easier to keep the spirit away from the targeted player. There are three spells that can and should be interrupted: Sand Bolt, Wrath of the Loa, and Wrath of the Loa. As the fight progresses, there will be more and more Quicksand pools on the floor. Whenever Sul the Sandcrawler casts Sandstorm, these pools do not disappear, they temporarily become Living Sands. When Sul casts Sandstorm during his third and fourth empowerments, you should be prepared to see a lot of Living Sands spawning. This creates a lot of confusion because it is difficult to focus on the ground effects and boss abilities, such as Reckless Charge, when there are so many adds on the screen. For this reason, the Living Sands need to be picked up quickly by one of the tanks and AoE-ed down with priority. Melee players should be mindful of the Quicksand pools that Living Sands leave behind when they die. One of the tanks will take High Priestess Mar'li and the other Sul the Sandcrawler. In addition to tanking their respective boss, the tanks will also need to alternate tanking Frost King Malakk, so as to never reach 15 stacks of his Frigid Assault debuff. Most of the boss abilities, such as Reckless Charge, Sand Bolt, Biting Cold, etc. cannot target them. That does not mean, however, that they can simply ignore them. These abilities can still target melee players next to to them. When this happens, tanks need to react properly, just like other raid members. When the Living Sands appear, it is best if the tank that is not currently tanking Malakk takes them. Towards the end of the fight, Sandstorm will create a large number of Living Sands, and it may be a good idea to divide them between the two tanks (the tank not currently tanking Malakk would be getting a larger share). In 25-man, you can use a third tank if handling the Living Sands proves difficult. As with most raid encounters, there will be a sustained amount of raid damage. At times, there will be increased damage on some players, and this is what this section focuses on. Expect higher tank damage when a tank is tanking Frost King Malakk (since they will be tanking Malakk plus another boss). Expect even higher tank damage when Sandstorm transforms the Quicksand pools into Living Sands. If a boss is allowed to reach 100 Dark Energy, they will start casting Dark Power every second until the empowerment is removed. The damage of Dark Power increases by 10% after each cast, so raid-wide damage can quickly get out of control. When Kazra'jin is empowered, he will enter Overload every time he casts Reckless Charge. As each player will receive, as Nature damage, 50% of the damage they deal to Kazra'jin, you should expect to use a few cooldowns when Kazra'jin is empowered. Loa Spirits and Living Sands should be killed as fast as possible. While it is important to break the bosses out of their empowerment before they reach 100 Dark Energy, the raid should not simply burn them down when they are empowered. Mar'li's and Malakk's abilities do not deal more damage while they are empowered. The increased raid damage from Kazra'jin's empowerment being the result of Overload reflecting 50% of the damage he receives, it is not advised to burn him down. Therefore, you will want the empowerment for each of these three bosses to run almost its full course, until 80 to 100 Dark Energy. Even if a boss gets to cast Dark Power, it will not wipe the raid right away, and you will be able to survive easily through the first 10 seconds or so. The exception is Sul, as you generally want to avoid the second cast of his Sandstorm ability, so you should burn him down while he is empowered. A consequence of not having to burn down bosses while they are empowered is that you can afford to spend some time damaging the other bosses. In that regard, we have two suggestions to offer. Try killing Kazra'jin and Sul the Sandcrawler first. This will reduce the number of times they get empowered, in turn reducing the damage the raid will take from Overload and the number of times Sandstorm will be cast. Refrain from damaging Frost King Malakk. This will ensure that Malakk is never the lowest health boss, preventing the Blessed Loa Spirit from targeting him, which can be problematic if Mar'li's tank is currently also tanking Malakk. Many raid groups have reported that burning Sul the Sandcrawler made the fight a lot easier. To do so, tank Sul next to Malakk or Mar'li if they are empowered and try to break the empowerment from cleave/AoE damage while focusing mainly on Sul. Use Heroism/ Bloodlust/ Time Warp at the pull. We recommend using Heroism/ Bloodlust/ Time Warp at the pull, when everyone will benefit from their cooldowns and procs. Alternatively, you can save it and use it if it becomes necessary, for example, if you will not manage to break a boss out of their empowerment in time or if you have issues handling the last spawn of Living Sands. To progress through the fight, you need to damage the bosses and properly deal with their abilities. As a result, there is practically no room for learning the fight. The Heroic mode of the Council of Elders encounter is a very challenging fight. The fight resembles the Normal mode in its execution, although there are several notable changes to the mechanics. In addition to the increased health and damage of all bosses and adds, something which is to be expected of any Heroic mode, there are several changes in mechanics. Lingering Presence increases damage done and Dark Energy generation rate by 15% per stack, up from 10%. Every other time that an empowerment is broken, a random raid member will receive a debuff from the Spirit of Gara'jal, called a Soul Fragment. This Soul Fragment can be passed on to another raid member through an extra action button that the player also gains. While the Soul Fragment is on a player, it stacks a debuff on them every 5 seconds, called Shadowed Soul. Shadowed Soul increases damage taken by 2% per stack, until the end of the fight. Passing the Soul Fragment to another player causes the new player to start stacking Shadowed Soul on them. The Soul Fragment can be passed along indefinitely. Players who take damage from Frost King Malakk's Frostbite are affected by Body Heat. 8 seconds later, they become unable to soak Frostbite for 8 seconds. When empowered, Kazra'jin casts Discharge instead of Overload. This spell reflects a percentage of the damage he takes to all raid members, instead of just to the attacking player. The Blessed Loa Spirits travel at increased speed. The Shadowed Loa Spirits no longer exist. Instead, when High Priestess Mar'li is empowered, she casts Twisted Fate. This spell targets two players (a nearby melee player and the farthest raid member from that player) and spawns a small add at the location of each player. These two adds travel towards one another and deal raid damage, which is greater the closer the two adds are to each other. If one of the two adds dies, the other one pulses AoE raid damage until it is killed. If two Quicksand void zones overlap, then they merge into one larger void zone. When Sul casts Sandstorm, these large, merged void zones spawn larger, more powerful adds. The strategy for the encounter works similarly to that for the Normal mode, with a few key differences. We will list them all here first, before detailing them further. You must make absolutely sure that Sul the Sandcrawler dies before he is ever empowered, because the adds resulting from his Quicksand (especially those from merged overlapping void zones) are extremely damaging and almost impossible to handle without many deaths. You must pass on the Soul Fragment so that each raid member ends up with around 5 stacks of the debuff. Once all raid members have 5 stacks, you can start passing it around again until everyone has 10 stacks. Players affected by Frostbite should stand away from other raid members, and they should receive copious amounts of healing, as well as defensive cooldowns. You must be very careful with the DPS done to Kazra'jin when he is empowered, since it will result in heavy raid damage. You must slow, stun and kill the adds summoned by High Priestess Mar'li's Twisted Fate. The first thing you need to understand about the Heroic mode strategy is the importance of the kill order. Sul the Sandcrawler cannot be allowed to ever be empowered, as we explained above, so you must kill him before this time. In order to do this, you will have to do as much DPS as possible to him during the previous 3 troll empowerments, all while making sure to break each of them in time. As the fight starts, you should tank Sul the Sandcrawler together with Frost King Malakk, and focus on Sul with Heroism/ Bloodlust/ Time Warp. Some cleave damage will be done to Malakk as well, and you will need to switch to Malakk before he reaches 100 Dark Energy and get him to 75% health. At this point, you should aim for High Priestess Mar'li to have higher health than Kazra'jin, so that she is empowered next. You should then repeat the same process as before, dealing as much damage to Sul, while making sure to break Mar'li's empowerment in time. Once Sul is dead, you should try to kill Kazra'jin next (although Frost King Malakk is also a valid target). The way to handle each Soul Fragment is essentially quite simple. The player who first receives it should keep it until they have 5 stacks of the Shadowed Soul debuff (so, about 25 seconds). After that, this player should pass the Soul Fragment on to another player who does not have any Shadowed Soul stacks, and so on. Tanks should never be given the Soul Fragment until Frost King Malakk is dead. Once everyone in the raid has 5 stacks of the debuff, players can start taking it up to 10 stacks, and all bosses should be dead long before anyone needs to take more stacks than that. Finally, players with good damage reduction abilities, such as Warlocks, can take more stacks to lighten the load on the rest of the raid. Frostbite deals more damage in Heroic mode, and due to the Body Heat debuff, it is not as simple as in Normal mode to reduce its damage. It is possible to set up a rotation of players to move into range of the player affected by Frostbite, and then to move out as soon as they are debuffed by Body Heat (since, not only will they no longer reduce the damage of Frostbite, but they will also take the full unreduced damage themselves). However, we do not find this tactic to be ideal, since it requires a lot of moving from your raid members, and it is very easy to have accidental deaths along the way. Instead, we recommend the players affected by Frostbite to move out of the raid, and endure the full, unreduced damage of Frostbite there alone. Healers will need to spam heal these players, and cast external damage reduction cooldowns on them, but this should be possible with a bit of practice. Kazra'jin's Discharge is one of the more problematic issues of the fight. Whenever Kazra'jin is empowered, the entire raid will take very large amounts of damage, so healers will have to use defensive cooldowns and make sure to keep the raid's health high. There is not much that you can do to reduce the damage taken, since there is a certain amount of DPS that must be done to Kazra'jin. That said, we recommend that every DPS player switches to the Blessed Loa Spirits summoned by High Priestess Mar'li whenever they spawn. This will give the healers a brief respite to top the raid off, since there will be no raid damage while Kazra'jin is not taking damage. Twisted Fate is not particularly difficult to handle. Whenever the ability is about to be cast, a designated ranged DPS player should move very far away from the rest of the raid, so that they are targeted by Twisted Fate (as the farthest-away player). This will result in a large distance between the two adds created by Twisted Fate, giving your raid enough time to kill them. This concludes our raid guide for the Council of Elders. We hope you have found it helpful. Please do not hesitate to post any feedback you may have on our forums. 07 May 2013: Added Heroic mode. 14 Mar. 2013: Replaced our PTR preview with our video guide. 14 Mar. 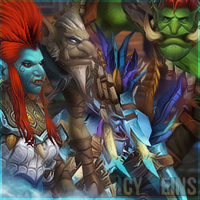 2013: Fixed Lingering Presence's values in normal mode (we were previously giving LFR values). 14 Mar. 2013: Added section for alternative strategy consisting in burning Sul first. 13 Mar. 2013: Added link to forum threads that contain class-specific advice for the encounter. 11 Mar. 2013: Fixed percentage of damage reflected by Kazra'jin during Overload (it is 50% and the guide was saying 25%). 11 Mar. 2013: The empowerment order for the first four empowerments does not seem to be fixed, as we were previously saying in the guide. 08 Mar. 2013: Added 25-man health values and updated 10-man values. 08 Mar. 2013: Improved explanations regarding which bosses to kill first. We believe the encounter is easier if Sul and Kazra'jin die first. 08 Mar. 2013: Fixed Sandstorm explanations. Sul will cast it every 40 seconds while empowered, not just once as we were previously saying. 08 Mar. 2013: Improved section explaining what happens when a Troll dies. 06 Mar. 2013: Added a section to explain what happens when a Troll dies.